(This is not the last time the narrator will have to defend HL against these rumours). His Lordship promises to arrange this very sight for him. Hell Screen is a wonderful story, particularly in its telling: its conclusion remains a mystery to its narrator but is entirely explicable to the reader. Yoshihide attempts to paint hell from reality; in the end his painting brings hell to life. This entry was posted on December 7, 2016 at 4:30 pm and is filed under Stories. You can follow any responses to this entry through the RSS 2.0 feed. You can leave a response, or trackback from your own site. I thought it was excellent. It does come with a shorter story, The Spider Thread, which is more of a parable. I’ll probably end up getting the Penguin Classics collection as I’d like to read more. Nice review, Grant – one that certainly generates interest in reading the story. I was aware of this author via the Rashoman connection, but I’ve never any of his work (well, not yet, but that may well change as a result of your post). As a slight aside, you might be interested in Natsume Soseki’s novel The Gate, if you haven’t read it already. 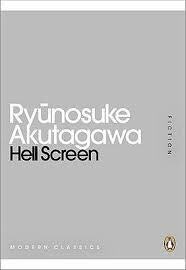 It’s rather different in style to Hell Screen – quieter and less dramatic – but it’s another Japanese classic published in the early 20th century. The two authors moved in the same circles back in the day, and I think Akutagawa looked up to Soseki as a kind of mentor or role model. Anyway, I wrote about The Gate the other week if it’s of interest at some point – once you’ve finished your short story bonanza, of course! I’ve read your excellent review – I’m just struggling to find time to comment at the moment! I recently bought Sanshiro in the Pocket Classics so that will be my first experience of Soseki – I’m looking forward to it. I’m really quite ignorant of literature from Japan and China. Oh, I can imagine! It just came to mind in connection with Akutagawa. I’m glad you’re planning to read Sanshiro as you can tell me what you think of it. Turns out that The Gate is the third novel in a loosely connected trilogy, part one being Sanshiro. Looks like I’ve accidentally started in the right place! Great review Grant. I enjoy Akutagawa, most famous of course for ‘In a Bamboo Grove’ which became the move Rashomon (both of which are excellent). I must have read Hell Screen but have no memory of it. Perhaps time to put Akutagawa on the re-read list. How are you enjoying your advent reads? I’m really enjoying it, though living in perpetual fear of falling behind (almost inevitable at this busy time of year). My only worry is that it’s introducing me to lots of great new writers who I’ll then want to read more of! Not an author I know, though I’ve heard of In a Bamboo Grove of course and Rashomon is brilliant. Anyway, this just sounds like a little gem Simon puts it. A definite one for my Christmas stocking. Yes, I think this has been the stand-out story so far for me. Yes – although I’m enjoying my short story reading, it’s not only stopping me reading all the novels I have waiting but introducing me to yet more writers!